When and why did you get involved with BRAC? I joined the BRAC Ambassador Program this past May. I was looking for a way to become more involved and to network with the Greater Baton Rouge business community. My job at Neighbors FCU is helping businesses with their financial needs in the Baton Rouge Area and volunteering with BRAC helps me keep abreast of changes in the business community to better serve them. Tell us more about how you are involved in Baton Rouge? As an employee of Neighbors FCU our mission statement is to “Build Relationships that Matter.” I’ve volunteered at various events for Baton Rouge Children’s Advocacy Center, Arthritis Foundation, and Pat’s Coats for Kids. This past Columbus Day, I volunteered alongside the entire Neighbors FCU staff (260 employees) and 13 other organizations and provided more than 1000 hours of service to the Baton Rouge Area. Why do you stay involved with BRAC? I was born and raised in Baton Rouge, and I truly believe in BRAC’s mission to make the Baton Rouge Area the best region to live and work. Being involved in BRAC allows me to contribute to that mission while having a great time! What would you tell someone considering becoming a BRAC investor? If you believe in making Baton Rouge the premier place to live, work, play and grow, then come join BRAC! BRAC has numerous benefits to offer its investors. Whether your business is large or small, BRAC has something to offer. What do you see for the future of Baton Rouge? How will we get there? Baton Rouge has a great future ahead. Once we overcome a few challenges, such as traffic, I believe nothing will stand in the way of Baton Rouge becoming a premier location for talent and business in the United States. BRAC helps bring leaders together to solve current problems and set up the infrastructure to continue to anticipate and solve future needs. What’s one of the most exciting things you see happening in the Baton Rouge Area today? I am excited about the recent developments to the downtown area and Government Street. I believe these developments will help retain and attract businesses and talent to the Baton Rouge Area. 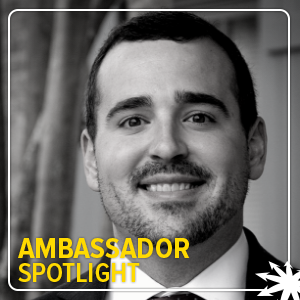 Each month, BRAC highlights one of these ambassadors in the Ambassador Spotlight. To learn more about the Ambassador Program visit the program page here.